Fokker F.70 F-GLIS (c/n 11540) is seen here in approach into Brussels IAP, on 04May99. The livery was really remarkable ! The French Transport Department did not renew the airline's license and the airline was forced to suspend its operation on Friday night (13th !). The airline's management made a final attempt to get the company back in the air. But a commercial court met on 17Feb04 and decided to close Air Littoral down. When the axe fell, the fleet counted 17 CRJ-100s, having operated from bases in Nice, Montpellier, Paris-Orly and Marseilles. 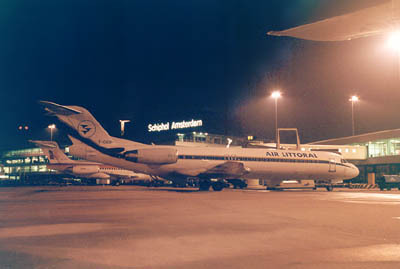 A nightshot of Fokker F.100 F-GIDP (c/n 11270), during the period when KLM had an active stake in Air Littoral. In 1991 KLM took a 35% stake in Air Littoral but sold it again the next year. A full 100% stake was acquired in 1992 by Euralair. An operations franchise with Air France commenced in 1993. Partnership with Lufthansa, in 1997, which allowed for a 15% stake. In 1998 the SAir Group (Swissair) acquired a 44% interest. This was increased to 49% by 2000. 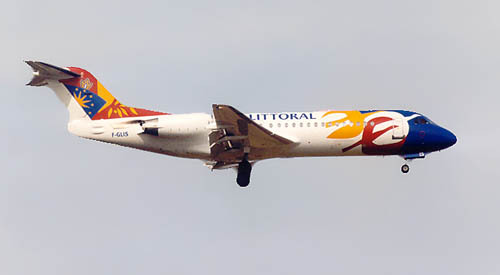 Air Littoral also became member of the Qualiflyer Alliance (1999). It was intended that Air Littoral was to be merged into the SAir Group during 2000 (including Air Liberti and AOM). This plan was cancelled. Swissair's stake was sold in 2001 to Air Littoral's former chairman, Marc Dufour. A takeover by Wexford Management (owner of Chautauqua and Frontier AL) failed in 2003 and a state of bankrupcy was declared. Various takeovers were considered: by Universal Capital Partners SA (Belgium, headed by Pierre Besnainou), and by Azzurra Air/Seven Air Group (during 2003), by Ionis Consulting Management Group (then Groupe Dumenil/La Filature du Favreuil) in 2004........ but all these plans never materialized.